Cross country trips are part of the training requirements for a private pilot’s license, and any student pilot should be able to tell you the requirement for a cross country flight: a landing 50 or more nautical miles from your starting point. So as far as the FAA is concerned, this flight doesn’t qualify, even though you’ll be covering more than 70 nautical miles. Why won’t it qualify? Because you’ll take off and land from the same airport: Westchester County (HPN) in White Plains, New York. And your flight plan is going to take you on one of the most impressive sight-seeing trips that you can enjoy from a single-engine private aircraft: down the Hudson river which separates Manhattan Island from the New Jersey shore. In real life, this is one of the most popular flights for private pilots in the northeast. You get to cruise over the George Washington Bridge, look down on the Big Apple including the theater district along Broadway, look up at the Empire State building and the impressive twin World Trade Towers, dip a wing in honor of the Statue of Liberty, and then head toward the boundless Atlantic Ocean that stretches beyond the Verrazano Narrows Bridge.Whoa! Back up a minute! What was that about looking up at the Empire State and World Trade Center? This trip is for a plane, not a tour bus, right? Well, you’re right, you will be flying down the river, but as with all Cross Country flights, you’re going to follow the real world rules for navigation and airspace restrictions. The Hudson is a narrow strip of water that is less than 10 miles from three of the busiest commercial airports in the country: Newark (EWR) in New Jersey and La Guardia (LGA) and Kennedy (JFK) on New York’s Long Island. As a result, the FAA has created a Byzantine Class B airspace (formerly a Terminal Control Area, or TCA) over the three airports. 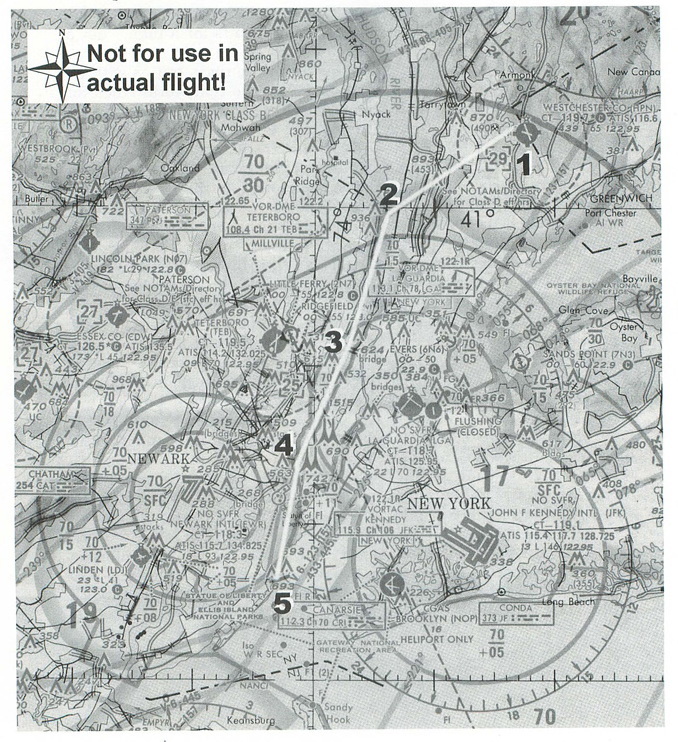 Fortunately, the FAA has also taken touring private aircraft into account when designing the airspace, so there is a corridor for VFR (Visual Flight Rules) aircraft that follows the Hudson’s path along a roughly north-south course. You can fly the length of it without once being obligated to contact any air traffic controller along the way. However, the heavy iron gets most of the airspace over New York, and the little planes have to settle for a low level limit for their sight-seeing lane. How low? A large part of the corridor is below Class B airspace that has a floor of 1100 feet. So I’ll plan your flight to remain at 900 feet—this gives you a 200-foot leeway to avoid busting the Class B limits. And “bust” is the correct word; poking through the floor of the Class B airspace without a clearance is likely to earn you an introduction with an FAA inspector. Now, I don’t want to add to the pressure, but keep in mind that there are lots of other pilots with the same idea as you. In good weather, there’s more traffic along the corridor than you’ll find at most airports. So plan on keeping your landing light on (for increased visibility) and your head on a swivel to watch for traffic while you make sure you maintain your altitude as close to the planned 900 feet as possible (and stay to right hand side of the river to fit in with the traffic flow) and you’ll do fine. Oh yes, and don’t forget to enjoy the scenery! I’ll plan the flight using pilotage techniques (relying on visual ground references) backed up by VOR radio navigation techniques. As mentioned at the start, you depart from and return to Westchester Airport in White Plains, which is northeast from Manhattan. As your plotted route indicates, you’ll fly a heading a bit south of west on a heading of 255 degrees so that you reach the river south of the Tappan Zee Bridge. In the real world (or if you have the Microsoft New York scenery collection) you could head to the Tappan Zee and turn south from there, but the FS5.1 default scenery thinks that the Hudson River dead-ends a few miles south of the bridge. Unfortunately, the default scenery does not include I-287 or the Saw Mill River Parkway or any of the other major roads in the area, so you can’t use roads for pilotage, either. Once you get to the river, you will make certain that you’re at your 900 foot cruising altitude, cross over to the right hand (western) shore, and turn south. From here on, it’s strictly a matter of pilotage. Stay over the water, but on the right-hand half of the river. When you get to the Statue of Liberty, you can proceed to the western end of the Verrazano Bridge, where you turn around, cross to the right hand shore (now the eastern side) and retrace your steps. To make sure that you stay out of Newark’s airspace on the southward leg once you reach the Statue, you’ll use the NAV1 radio tuned to the Colt’s Neck VOR (located south of Sandy Hook in New Jersey) on a frequency of 115.4. If you set the OBS to 205 degrees, and keep the needle deflected to the right of center, you’ll stay in the clear. After you complete your trip back up the river and reach the end of the river, you’ll turn north of east on a heading of 75º, and then watch for the airport. To make sure that you don’t overshoot it, you’ll use the NAV2 radio tuned to the Carmel VOR on 116.6. Set the OBS to 40 degrees, and the needle should center just before you reach the airport. If the needle centers and you don’t see the airport yet, it is either to your right or left. Look out the side windows or fly along headings of 40 and 220 degrees with the NAV2 OBS needle centered and you should find the airport sooner or later. When you do find it, you can assume that the tower has cleared you to make a left-hand pattern approach and landing for Runway 29, so you can plan on entering the pattern on the downwind leg. I have prepared a flight log for you. The Fixes column lists the departure and destination points, as well as turning points and visual checkpoints along the route. The Route columns list the magnetic course for the leg, and the cumulative distance (in nautical miles) between points in the log. The Estimated columns include the Ground Speed and Total Time entries. Since I’ve planned this flight for calm wind conditions, the ground speed will equal the airspeed, so there’s only one entry in that column. You want to enjoy the scenery, so I’ve planned on 130 knots for the Cessna 182. Note that I only planned one minute for your take-off and climb-out; you won’t need much more than this because your cruise altitude will be so low and because you’ll be launching in your direction of travel. The Actual column is for you to use. Use a stopwatch or the clock on the airplane’s panel to keep track of the elapsed time, and enter the time at each point of the trip. You’ll know when you should be coming up on the next checkpoint or turn, which helps you stay “ahead of the airplane” by anticipating the next step before its time comes. Keep in mind that the estimated times are based on when you pass the point, not when you first see it. The flight log also helps you measure your performance, by seeing how well your times match the predicted times. If you can touchdown at Westchester within a few minutes of the predicted time, you’re doing very well. The four checkpoints are straightforward for this trip. The “end” of the Hudson marks the end of the river in the default scenery. The George Washington Bridge is the only road that crosses the Hudson to Manhattan, and the World Trade Towers are a pair of skyscrapers that are close together near the southern tip of Manhattan. The Verrazano Narrows Bridge is at the mouth of the Hudson where it meets the Atlantic. When you choose OK on the dialog box, you should find yourself positioned at the end of Runway 29 in Westchester. Next, set the radios. To be absolutely faithful to reality, you would have to contact Ground Control and the Tower at Westchester in order to take off, but we’ll skip that for now. Instead, tune your COM1 to 123.05 which is the frequency for self-announcing your position as you fly along the corridor. In real life, you’d also be paying close attention to the position calls of other aircraft on that frequency. Set NAV1 to 115.40 and the OBS to 205, and NAV2 to 116.6 with the OBS at 040—notice that the needle on NAV2 is deflected to the left of center, which means you’ll cross that radial soon after you take off. Because this is a VFR flight, set your transponder to the VFR squawk code of 1200. You’ll also want to be as visible as possible, so make sure that both your Strobe and Lights are on. Finally, let’s add a little spice to the flight. The Manhattan skyline is impressive during the day, but it gets positively breathtaking from sunset to dusk. (Incidentally, this is the time of day that I first flew this route, as I was finishing off my final preparation for my pilot’s license checkride.) So use the World Set Time and Season menu command to open its dialog box, and use Set Exact Time to set Hours to 18 (which is 6 PM) and Minutes to 15. Check the Set Season box and make sure it is set to the default setting, Spring. So now you should be all set to launch. Take off, follow your flight log, and be prepared for a sight-seeing treat. Remember to watch your altitude and to look out for other traffic, pay close attention to your ground track so you stay out of restricted airspace, and be prepared for it to get a bit dark before you get back to the airport—night landings can be a bit trickier than daylight landings. If you want to add to the challenge, dial in 10 to 15 knots of wind out of the west (270º magnetic) so you have to compensate for drift as you travel up and down the river. In any event, you’re likely to find that you have your hands full on this flight. Don’t forget to take the time to enjoy the sights, however, and wave to all those tourists stuck on the ground at the Statue of Liberty. They’ll be wishing they could enjoy the view from your seat!